KABUL, Afghanistan (CNN) — Civilian casualties resulting from Afghanistan’s war have spiked, jumping some 24 percent above figures from last year, the United Nations reported Friday. 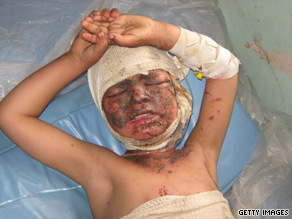 Fifty-nine percent of this year’s civilian casualties resulted from insurgent bombs. Western military airstrikes killed 30.5 percent of the civilians. The UN highlighted a pattern of deadly Taliban attacks, targeting humanitarian workers, government employees, medical and educational staff… and in particular, girls’ schools. Despite the creation last year of a military commission to track civilian deaths, Western airstrikes “remain responsible for the largest percentage of civilian deaths” attributed to foreign troops in Afghanistan.